If you’ve ever seen the James Bond movie Moonraker, you’ll know that sending your hero into outer space can have mixed results. But that’s what Nintendo did with Super Mario Galaxy – to much greater effect! 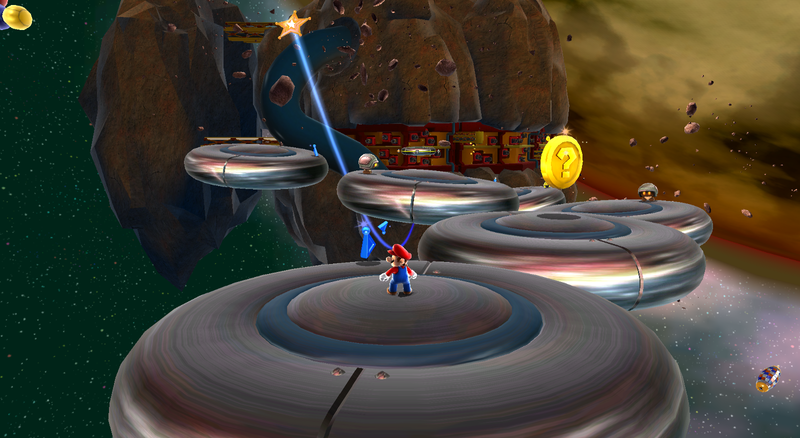 The journey to 2007’s Super Mario Galaxy began over ten years previously. After conquering 2D platforming with the Super Mario Bros. games, Nintendo successfully translated their mascot into 3D with the classic Super Mario 64 in 1996. Super Mario 64 added exploration and light adventuring to the platform-’em-up formula. Nintendo struck a balance: abstract platforming of floating block fortresses was combined with more quote-unquote “realistic” cohesive worlds like Jolly Roger Bay, with its sunken pirate ship and hidden treasure. Where 2D and 3D blended perfectly was in the Bowser boss stages: pure platforming that freed the player to chain together Mario’s jumps, dives, and somersaults. Six years later, in 2002 Super Mario Sunshine refined the formula. 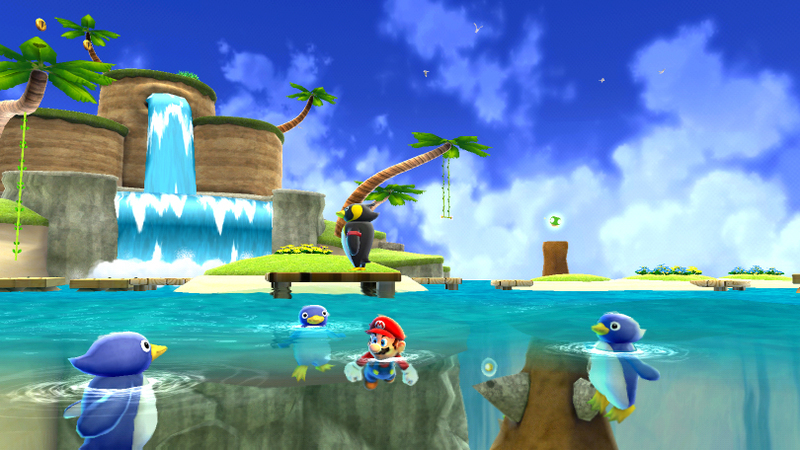 Super Mario Sunshine went deeper into adventuring, with Mario vacationing on the more grounded Isle Delfino, a tropical resort complete with hotel, harbor, and beaches. The game even gave Mario a busman’s holiday: fitted with a water pack, our heroic plumber was tasked with pollution clean-up. Only in a few special levels did Sunshine go retro – challenging the player with blocks and platforms floating in space. 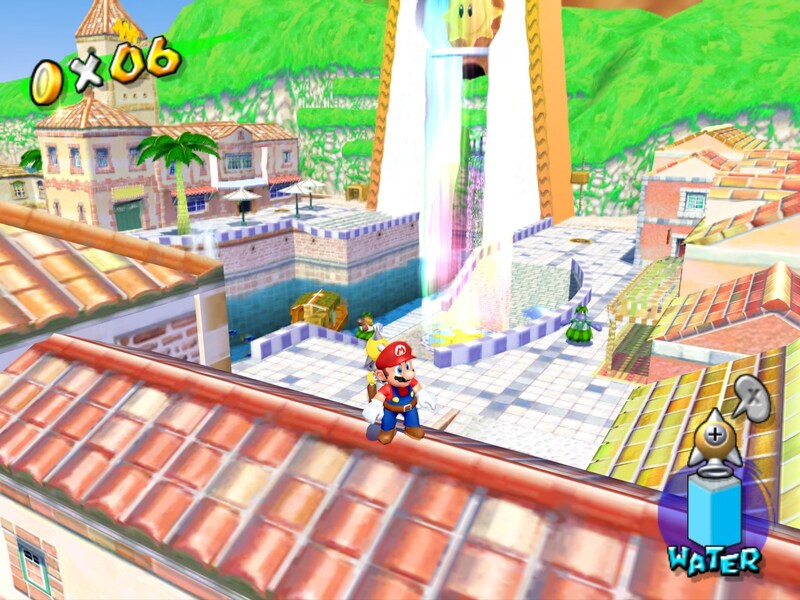 Isle Delfino is a cheery and warm setting for a video game. If the Beatles had made a left turn into calypso music in the Caribbean instead of expanding their minds in India, Sgt. Pepper might have been something like this magical world. But Super Mario Sunshine was rushed: it had an uncooperative camera, loose controls, and Nintendo fans could not get on with FLUDD, despite its ingenious gameplay hook of hovering using jets of water. The thing about Nintendo: they just “get it”. Especially this: video games should give players mastery over their environment. The Super Mario series evolved this philosophy. And in 2007, Super Mario Galaxy took another giant design leap. Though at first glance, Super Mario Galaxy looks like an incremental step. The level select hub, the themed worlds, each Power Star representing a new challenge – they’re all here. And Nintendo 64 and GameCube veterans were reacquainted with familiar Mario moves: the backflip, long jump, side somersault, and triple jump. But Super Mario Galaxy streamlined the template, stripping back the sprawl of Mario 64 and Sunshine’s open worlds. Each level in Galaxy is handcrafted, each world perfectly constructed to deliver a unique challenge. In Super Mario Galaxy the abstract is back: levels are designed not to make geographical sense, but to create compelling obstacle courses. And after taking Mario into three dimensions, where could Nintendo go from there? Space, it turns out, and Super Mario Galaxy gets you thinking spatially – there’s often no up or down, and gravity shifts around. In the early stages there’s the sheer joy of launching Mario into a low orbit around a planetoid. You can swim in a sphere of water suspended in space, fly through galaxies, bumble around as a bee, float as a ghost, skate across frozen planets, and run, jump, wall kick, and slide across a variety of inventive worlds. Super Mario Galaxy – or, Super Mario Gravity, amirite?! Motion controls – often neglected or misused in the Wii era – are put to good use here. Physics-based gameplay has you drawing Mario through space using Pull Stars, launching him from point to point using Sling Pods, and surfing on a manta ray. Nintendo even shows us what the disappointing Super Monkey Ball sequels might have been, with Mario balancing on top of a rolling ball, requiring you to tilt the Wii Remote gently to direct his movement. I have never been in awe of level design as much as with Super Mario Galaxy. Every world is unique and innovative, constantly shifting and surprising. Literally every level! Nintendo harnesses the gravity-based gameplay, flipping Mario around in endlessly innovative ways. Basically, this game is magical, like Christmas morning as a kid. 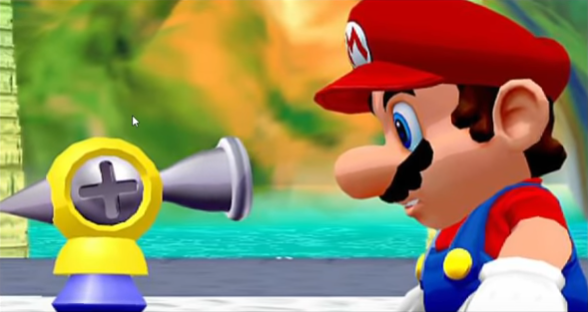 While Super Mario Galaxy reverses course after two open-world games, there is one design hook that is really a refinement of Super Mario Sunshine’s FLUDD. 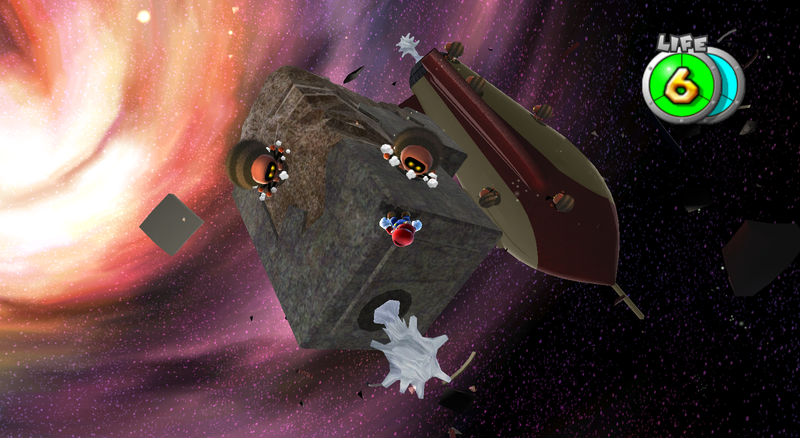 You can criticize FLUDD as a character – but in gameplay terms, hovering after a mistimed jump was a lifesaver. 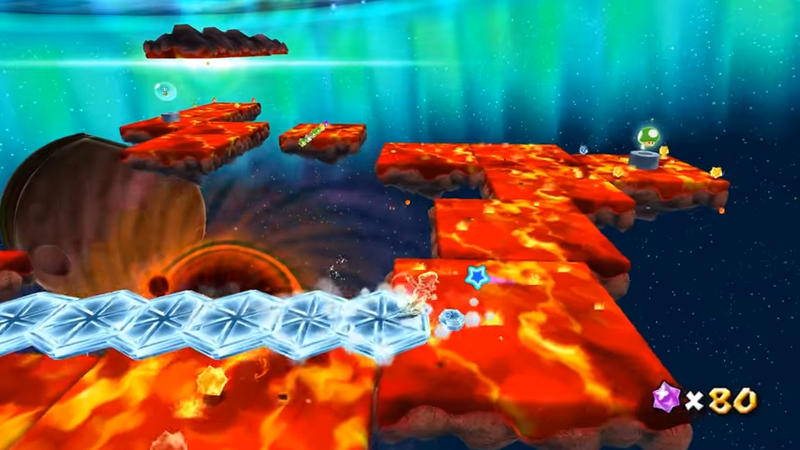 In Super Mario Galaxy, Mario’s new companion Luma plays a similar role. Though not as forgiving as FLUDD’s water hovering ability, a shake of the Wii Remote sends Mario and Luma into a midair spin, providing a valuable split-second of hang time. Luma is often the difference in making that precision landing. It’s another example of Nintendo expertly weighting the difficulty level. Both motion and traditional controls are spot-on. Unlike the unfinished Super Mario Sunshine, you can’t blame the controls or camera this time. 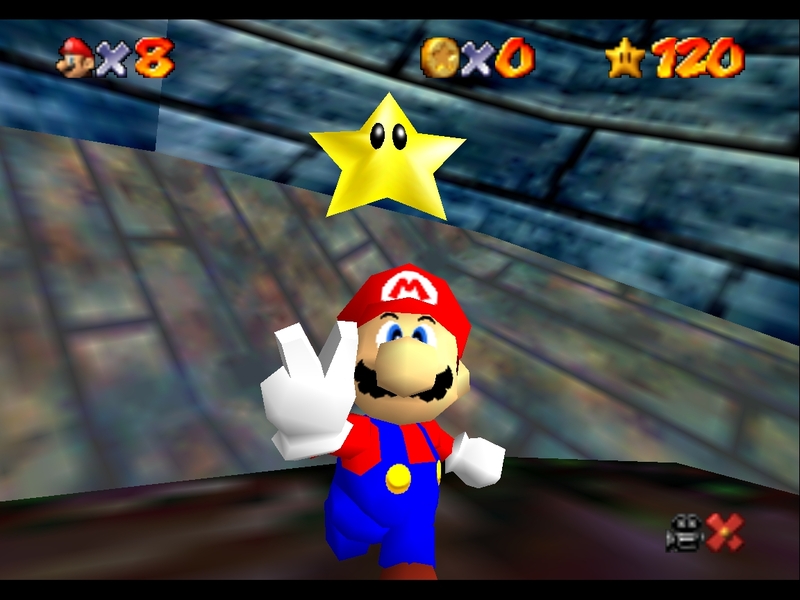 Mario’s moves are back to the responsiveness of Super Mario 64, and the camera moves in harmony with the action. The Super Mario series has a long history of catchy music – that original calypso theme is now iconic. For Super Mario Galaxy, Mahito Yokota and the legendary Koji Kondo surpassed everything that came before in this series. 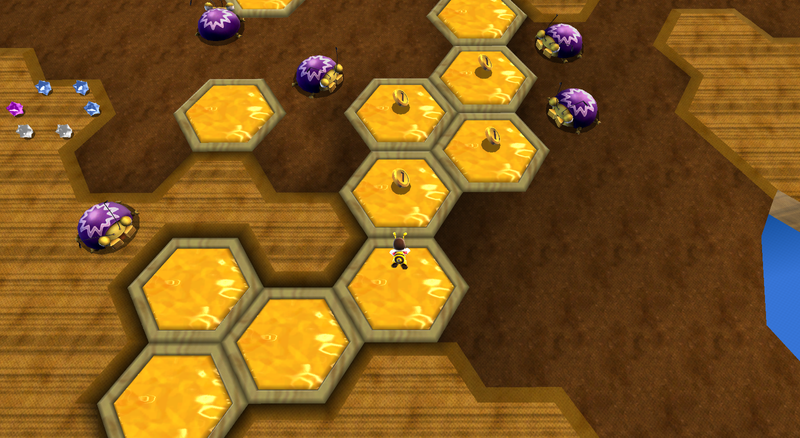 There’s a sweet bluesy tune for the bee-themed Honeyhive Galaxy! There are so many striking tracks contained within. Longtime Mario fans will recognize the steel drums of the Beach Bowl and Sea Slide Galaxies. Haunted by all too cute Boos, the Ghostly Galaxy level is charmingly spooky. Nintendo gave us the nostalgic throwback to the Bowser boss stages from Super Mario 64. And there are also moments of surprising drama, like Buoy Base Galaxy, which wouldn’t be out of place in any sci-fi adventure. To date, Super Mario Galaxy stands as one of Nintendo’s best scores – as good as anything composed for the more cinematic Zelda series. If Pixar were a video game developer, they’d be Nintendo. Inventive ideas, high production values, and brightness and color define both companies. They also dig into deeper and more challenging concepts. 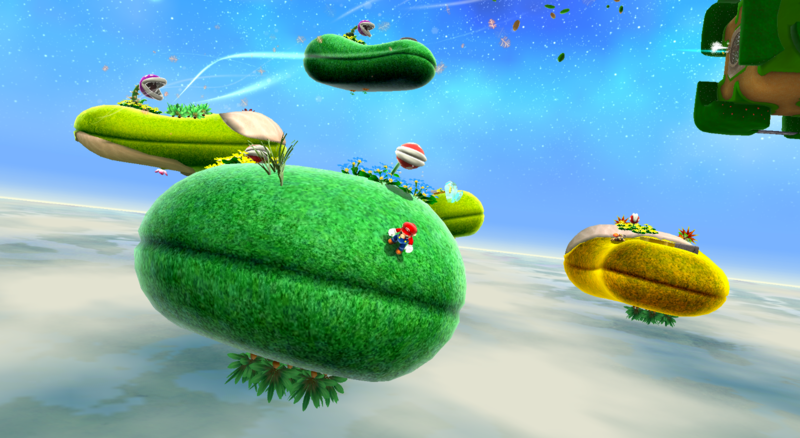 The Islands of Personality from Pixar’s Inside Out are, for me, reminiscent of Super Mario Galaxy’s themed levels. The conventions of fire, ice, deserts, and haunted mansions are present and correct, along with new ideas like the bee world of Honeyhive Galaxy, the Space Junk and Battlerock Galaxies with rocket ships and flying saucers, and the tropical Beach Bowl Galaxy featuring, er, penguins. Though technically less powerful than the PlayStation 3 and Xbox 360, Nintendo showed off the Wii’s capabilities. Super Mario Galaxy bursts with color and light – and irreverent humor, with the Toads providing moments like “Going to my happy place!” when Bowser attacks. Those little planets can be a bit fiddly. Trying to keep things “straight” when sprinting around the far side of a planetoid can be confusing. Oddly, the game tutors you on the use of the Wii Remote, but assumes you already know the triple jump, long jump, and side somersault. Mario’s moves have been broadly similar since 1996, but it’s a strange omission. My biggest complaint? Super Mario Galaxy is gamepad-crushingly frustrating in places. Mario has only three bars of health; “Daredevil” comet challenges then spike the difficulty further, limiting health to only one point. Other Power Stars have you revisiting previously completed levels to race against the clock, vacuum up purple coins, and collect “special” Luigi stars. Even the Andrex puppy felt this was too padded. And then more padding! Complete all 120 Power Stars and you get to replay the entire game, this time as Luigi – whose special talent is controlling like a bar of soap. Right at the very start of Super Mario Galaxy, Mario runs towards Peach’s Castle – a loose, wavy run, arms outstretched. The intro immediately puts a smile on your face, setting the tone for this sunny, joyous game. When you’ve been a gamer since you were a kid, you’ll have played enough to see the seams. You anticipate the beats, know the design templates: get from point A to B, get the key, unlock the door. With Super Mario Galaxy, all feels fresh and unexpected. I couldn’t see the joins. 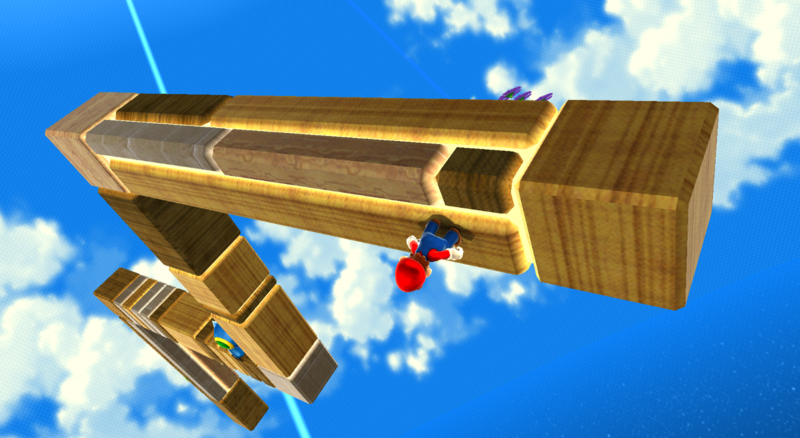 Super Mario Galaxy literally turns platform gaming upside down. This is a brilliant, bright, cheerful, surprising, and utterly entertaining video game. Perhaps the most astounding thing is that Nintendo still had enough in the tank to make a sequel only two years later. You can debate whether Super Mario Galaxy 2 is technically better. Maybe it is. The hub world is more straightforward, there are more hints and checkpoints, and less punishing prankster comet challenges. Plus it has Yoshi! But it’s needless to argue “which is the best” in a series that boasts Super Mario Bros. 3, or Super Mario World, or Super Mario 64, or the new Super Mario Odyssey. I love Super Mario 64. Back in 1996 Nintendo created a gaming experience that I didn’t think could ever be improved. I still love Mario 64, but Super Mario Galaxy might be even better. An undeniable classic, Super Mario Galaxy is an inventive space-based obstacle course with Mario a freerunning maestro and the design, controls, and music all harmonious. Super Mario Galaxy is as perfect as a video game can possibly be. Thanks Matt, I appreciate it! I don’t know how Nintendo packed so many great ideas into the Mario Galaxy games! It’s a magical game – a masterpiece. You just get a sense of total joy playing it, which is what Mario games are all about for me. I preferred the first over the sequel, too. It’s so true, Mr. W! Mario Galaxy is just such a cheerful, inventive game, and that’s what Nintendo does so well. Thanks! Lucozade and video games are the go-to cure for any illness! Nice piece Nick. You hit the nail firmly on the head: Super Mario Galaxy is a truly magical game. It’s fair to say you are reduced to a child playing it… in the best possible way! Everything about that game is spot on. While I do think it’s largely pointless to say which Mario is the best, a tough task indeed, Galaxy always comes to my mind first. Odyssey was superb, but I’m not sure it ever surpassed it. Thanks Jamie! It definitely felt like being a kid again playing this one. It’s so difficult to look at the Mario series, where nearly every game is a highlight, to figure out which is the best. But Mario Galaxy has to be way up there. I still haven’t played Super Mario Odyssey! Thanks! I love Luigi as well, but boy is he difficult to get under control in Mario Galaxy! I can’t believe I’ve never thought of the Pixar/Nintendo comparison before, it’s so accurate! Thanks! I remember watching Inside Out, thinking the themed worlds were video game-like! I had mostly stopped gaming after college. Galaxy was the game that captured my then very young son’s attention and imagination and fostered my return to gaming. He and I have been video gaming buddies ever since! Great write-up, Nick. Thanks Joshua! That’s awesome that you and your son bonded over playing Mario Galaxy!